This is a guest post by members of the Team Alpha – Hajar, Zainab, and Farah – check out the CaB Challenge page, here. We have learned early in the competition that the creators of the CaB Challenge have definitely achieved their goal in making it a challenge! We spent almost three weeks coming up with plausible ideas we could pursue. Idea generation was a difficult step, as there were so many ideas that had potential. If you’re not familiar with the CaB Challenge, check it out here before reading on. Our team is diverse in discipline: Hajar is a Biomedical Science student; Farah, a Biology student; and Zainab a Chemistry student. We found that our interdisciplinary knowledge was a major advantage in the brainstorming process. Each group member had speciality knowledge in their niche area, which played well to the weaknesses of individuals on the team. As a result, we had three different perspectives toward each idea we considered. Obviously, there were many ideas we had to scrap. During our first meeting as a group, we all got hung up on one particular idea. The pine beetle is a pest that has cause vast damage to pine forests over thousands of acres in Western Canada, and poses a serious threat to Canadian forestry. Trees are such an important part of our every day lives in the paper products we produce from them, and they also provide habitats for thousands of different animals and play a key role in regulating temperature during the summer. We considered researching ways in which we could genetically modify pine beetles to prevent them from introducing the fungus into trees that eventually causes the damage. However, there are a host of ethical issues associated with genetic modification that we would have to address in detail, something we are not prepared to do at this point in our scientific careers. Ultimately, we decided to scrap this idea. We investigated several other ideas, including using bacteria to filter water and modifying drug packaging to improve the shelf-life of medications. At the end of January, we had come across an interesting gene which functions in many organisms to allow them to survive very cold temperatures. This “antifreeze” gene works by producing certain molecules that allow the organism’s cells to continue doing the work needed to keep the organism alive at freezing and below-freezing temperatures! We began to examine the many ways we could apply this gene to existing challenges. Many scientists have already done research with this gene; it has been considered for preserving human organs during longer transplantation surgeries, which is an excellent idea, but again presents several bioethical challenges. We considered the possibility of using the gene products to coat tires, allowing them to melt snow as they are used, an alternative to salting roads. However, we couldn’t identify a cost-effective way to recoat tires with the gene product, a necessary requirement of the application. At this point, we had our epiphany! 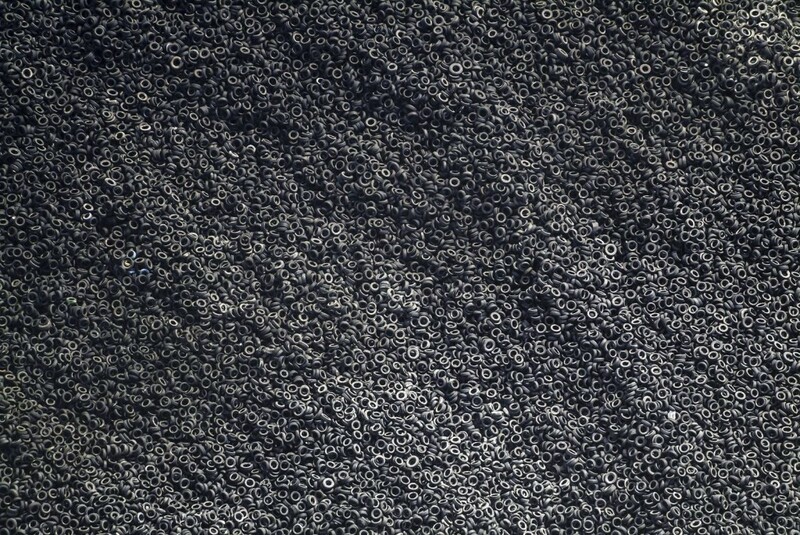 Annually, millions of tires are thrown into landfills where the rubber material they are made of prevents them from being degraded or effectively recycled! With a quick perusing of the literature, we confirmed that rubber-eating bacteria have been researched previously. In our formal proposal, we will explore how rubber-eating bacteria can be modified using synthetic biology to breakdown tires, and how the by-products of this breakdown can be used to construct highways or manufacture sporting goods. Have any idea how we’ll do it? We’re not sure yet either! But stay posted next week and we’ll tell you how we broke it down in our proposal. To learn more about the members of the Team Alpha – Hajar, Zainab, and Farah – check out the CaB Challenge page, here.